For technology professionals, education has been a rewarding place to work over the last year. 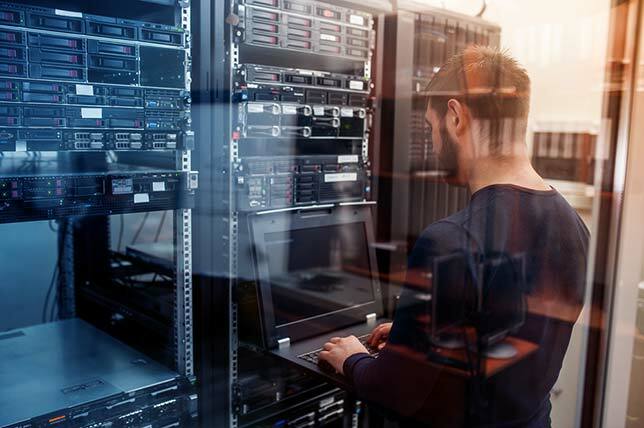 Salaries are up for the most part; job satisfaction is high; and the outlook for the future is positive — these according to the results of our third-annual K–12 IT Salary & Job Satisfaction Survey. Overall, the average salary for technology professional in education (excluding classroom teachers) was $66,640 in 2017 — up about $3,000 from 2015 (fig. 1, click to enlarge). Project managers and help desk/support staff salaries took a hit in this year's survey as well. Project managers declined to $70,636, down from $74,940 in 2015. Help desk/support fell slightly over the same period, from $41,425 to $40,410. Database administrators, who jumped nearly $13,000 from $76,436 to $87,000. In the broader categories (fig. 2, click to enlarge), several even more substantial jumps were seen over the last two years. Database/business intelligence staff rose almost $15,000, from $76,436 in 2015 to $91,333 in 2017. Respondents from the smallest schools or systems (0–499 students) had the lowest overall weighted average salary, at $59,456 ($58,874 at small private schools, $59,731 at small public schools). Employees at the largest schools (3,000 or more students) had the highest weighted average salary: $79,552 ($77,742 private, $80,300 public). Elementary schools had the lowest salaries on average — $60,161 for tech pros in public elementary schools (excluding teachers) and $52,700 in private elementary schools. The average for public secondary schools was $62,604 and, for private secondary schools, $62,926. Those at public combined elementary came in at an average of $73,225. Private combined schools came in at an average tech salary of $70,206, excluding teachers. 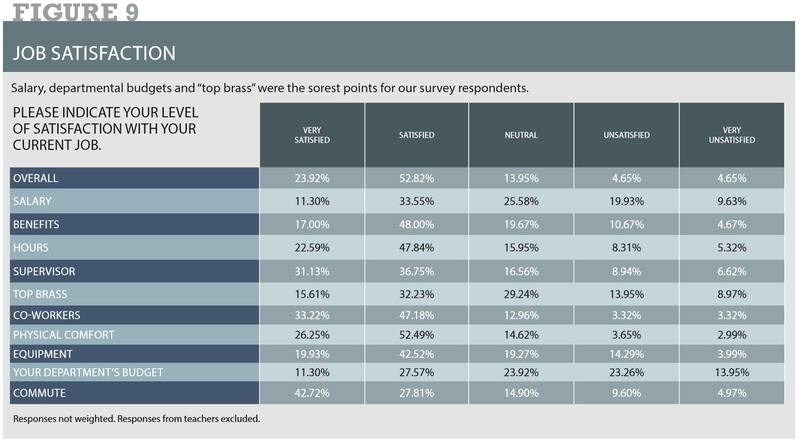 Technology professionals in education are, for the most part, quite satisfied with their jobs. About 84 percent plan to stay in their current position in the coming year (fig. 7), with just 16 percent expecting to leave their current employer. That's not terribly surprising, given that a majority of respondents have been with their present employer for 11 or more years, with a full 20 percent at 21-plus years (fig. 4). Overall, more than three-quarters (77 percent) are satisfied or very satisfied in their jobs (fig. 9, click to enlarge), with just 9 percent unsatisfied or very unsatisfied. So what do tech pros like the most? Rounding out the top 5, supervisors received a satisfaction rating of 68 percent. "Top brass," with a 23 percent dissatisfaction rating. The outlook in technology in the K–12 education sector is positive. More than two-thirds of respondents said they expect to see healthy or unbridled growth and opportunity in the future (fig. 8, click to enlarge). Another 27 percent predicted continued stability. Just under 6 percent said the sector is in a slow decline. And, for the first time in this survey, zero respondents predicted doom in the near future. A majority of our respondents said they expect to receive a pay raise (fig. 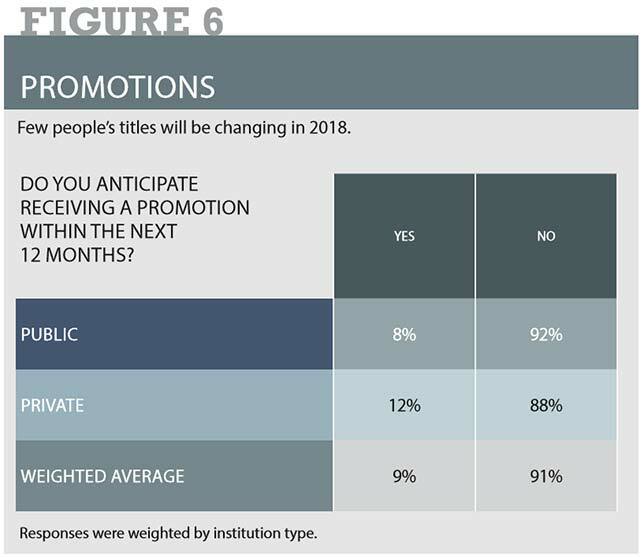 5) in the next year (51 percent), though the vast majority (91 percent) said they won't receive a new title to go along with it (fig. 6). THE Journal polled its readership in the summer and fall of 2017. We put out an open invitation to IT professionals in education and incented them to participate with a $250 Amazon gift card as a prize for one randomly selected winner and promised confidentiality for respondents. The survey was advertised on thejournal.com and in newsletters and e-mail promotions to our subscriber list, and recipients were asked to encourage colleagues to participate as well. The final tally for qualified respondents was 338, of which 326 were from public institutions, the rest from private institutions. Where noted in the figures accompanying this article, vetted responses from qualified public and private institutions were weighted by institution type to be representative of the nation as a whole based on data from the United States Department of Education. Geographically, our respondents tracked somewhat closely with ED's regional data for K-12 institutions (using census regions), with the East South Central region the only significantly overrepresented area. New England: 6.8 percent; Mid Atlantic: 11.8 percent; East North Central: 14.2 percent; West North Central: 6.8 percent; South Atlantic: 30.2 percent; East South Central: 8 percent; West South Central: 8.8 percent; Mountain: 5.9 percent; and Pacific: 7.4 percent. The breakdown in student body size among vetted respondents was: 0-499: 19.8 percent; 500-999: 26.7 percent; 1,000-1,499: 15.4 percent; 1,500-1,999: 5.3 percent; 2,000-2,999: 7.4 percent; and 3,000 or more: 25.4 percent. The survey consisted of 14 questions, 13 of which were mandatory. A final open-ended question asking for additional comments was optional, though nearly one-quarter of the qualified respondents (23 percent) chose to add their two cents.